Fifth-year senior Curt Maggitt is ready to help Tennessee reach its potential in the 2015 season. KNOXVILLE, Tenn.—The clunk-clunk-clunk of marching cleats echoes through the south wing of Tennessee’s football facility. It’s a sunny March afternoon, and a sea of players file through an open door in the program's Anderson Training Center. The Volunteers have just completed another practice this spring on Haslam Field. Each passing player dons either an orange or white jersey, save for the handful of quarterbacks, who wear red tops. Sitting a few yards away from his teammates, Curt Maggitt sports a different outfit. Tennessee’s fifth-year senior linebacker wears a black shirt with a bulky shoulder harness. Due to off-season surgery, Maggitt hasn’t been able to practice. Instead, he has watched his young team and realized he's become a senior citizen. Some of his teammates, he notes, don’t even know the old location of the locker room. ​​Maggitt has been at Tennessee for a while. In fact, former Vols coach Lane Kiffin initially recruited the Palm Beach Gardens, Fla., native out of high school in 2009. That’s six years and three head coaches ago. Maggitt deserves an orange AARP card, but he’ll settle for a successful season. And that just might happen this fall. The timing of Tennessee’s hype coincides with the end of a long road for Maggitt. The former four-star prospect, according to Rivals.com, out of Dwyer High signed in 2011 under former coach Derek Dooley. Maggitt picked Tennessee over in-state option Florida, as well as SEC foes Alabama and LSU. Dooley’s signing of Maggitt was considered a steal. The Gators’ roster included a number of Maggitt’s former Dwyer teammates, like quarterback Jacoby Brissett and safety Matt Elam. But Florida’s history of player arrests didn’t sit well with Maggitt’s family, especially his father, Roosevelt. Plus, the Maggitts reportedly took offense when a Florida assistant propped his feet on their coffee table during an in-home visit. Maggitt might have been destined to play at Tennessee, anyway; his high school coach at Dwyer is named Jack Daniels. As a freshman Maggitt wasted no time in proving he belonged in the SEC. He and teammate A.J. Johnson became the first true freshmen in school history to start a season opener at linebacker. Maggitt went on to start eight games in 2011 and earned SEC All-Freshman honors after compiling 56 tackles with 5.5 for loss. That momentum halted during Maggitt’s sophomore season, as he suffered a torn ACL in an overtime loss to Missouri in November 2012. Even before the injury, Maggitt had played through turf toe and a shoulder stinger for much of the year. Times were tough for a player who had shown immense promise as a freshman. After Tennessee hired Jones to replace Dooley before the 2013 campaign, the new coach worked to reinvigorate Maggitt’s spirits. But Jones also delivered some tough love. He told Maggitt—who redshirted for the full ’13 season while his knee recovered—that only he could control his response to adversity. So, Maggitt leaned on his vast network of support: his family, including brother Roosevelt, Jr., a former Iowa State defensive end; and members of the Tennessee community, such as ex-linebacker Herman Lathers, who he points to as his longtime mentor. But Maggitt gleaned some of his best advice from former Vols defensive back Inky Johnson. Johnson suffered a career-ending shoulder injury in a 2006 victory over Air Force and now works as a motivational speaker. Johnson told Maggitt to appreciate the opportunity he still has at Tennessee. “Like Inky said: If you disrespect the game, it ain’t no good,” Maggitt says. 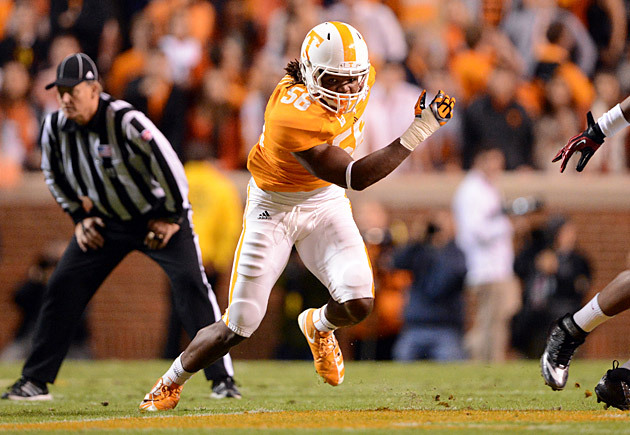 ​Maggitt returned for the 2014 season, leading the team with 11 sacks and finishing second with 15 tackles for loss. Tennessee went 7-6, its highest win total since 2009. Meanwhile, coaches began to utilize Maggitt’s versatility. The 6’3”, 245-pounder played defensive end and multiple linebacker spots. He and freshman Derek Barnett combined to record 21 sacks, the third most of any duo in the FBS. Maggitt now splits time between the linebacker and defensive line position meetings. After toying with an early departure for the NFL, Maggitt decided in January to return to Knoxville for a fifth season. The Vols opted for surgery to correct another minor issue on Maggitt’s shoulder, which kept him out of spring ball. But rehab gave the senior a chance to mentor Tennessee’s younger talent. Last year the Vols’ two-deep depth chart counted 15 freshmen. The defensive line also had only five healthy scholarship players this spring. Maggitt, in turn, took younger guys under his wing, from film study to de facto coaching during workouts. Maggitt’s example extends beyond Tennessee’s practice facility. Jones says Maggitt leads the team in community service hours. He has held two off-season internships with local businesses, the first at Omega Technical Services in Oak Ridge, Tenn., and the second with Knoxville-based Pilot Flying J. One afternoon Maggitt walked through Tennessee’s football facility with a visitor. He passed Jones as the coach ventured to a gathering of local media. Jones pulled Maggitt aside and said, “We miss you out there.” The coach then offered a few quick notes on the Vols’ younger players. Barnett, fellow defensive lineman Jakob Johnson and a number of others will ultimately inherit what Maggitt helped build, and the upperclassman enjoys getting constant updates on their progress. That’s the biggest reason Maggitt decided to return to Tennessee: The rebuilding process isn’t over. When Maggitt signed with the school in 2011, the program was coming off a six-win season. The freshman linebacker made it a goal to bring the Vols back to contention. Four seasons later, that might finally become a reality.